Social Login allows your users to connect with one click to your Zen-Cart shop by using their social network accounts. Gather rich demographic information (age, gender, phone numbers ...) about your users without requiring them to fill out any forms. Obtain pre-validated email addresses and increase your data quality. 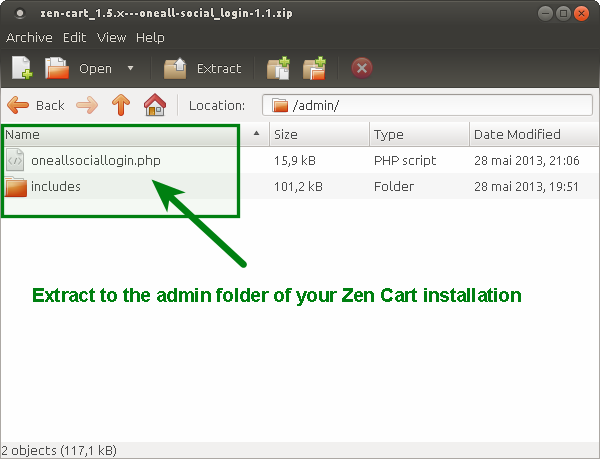 Social Login seamlessly integrates into your ZenCart shop so that you and your users don't have to start from scratch. The installation is not very complicated and should only take a couple of minutes. Please follow the instructions carefully and do not skip any steps. 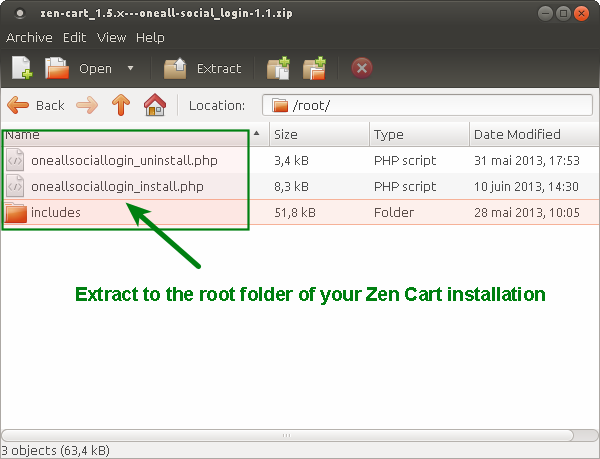 Extract all files and folders included in the /admin/ directory of the archive to the /admin/ directory of your Zen-Cart installation. Existing files have to be overwritten. For security reasons you should remove the installation file after having successfully installed the plugin. 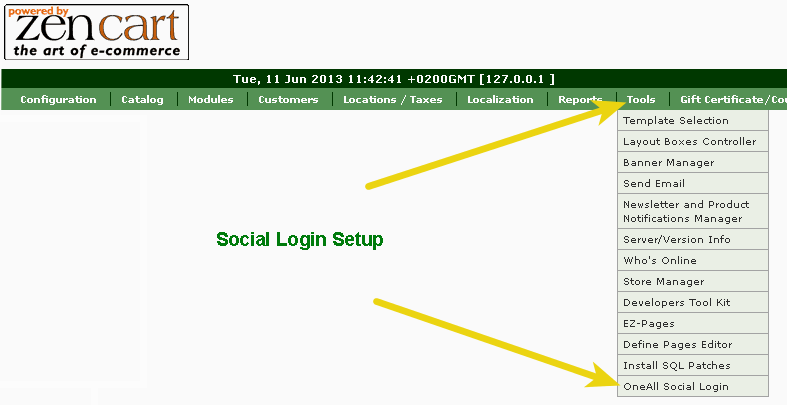 To install Social Login you need to open the file oneallsociallogin_install.php in your browser. Done! Please remove this file now. If this file does not exist, then please return to step 1b and make sure that you have correctly added the plugin files. After having installed the Social Login you have to enter your OneAll API credentials and you must setup the social networks that you would like to use. Please follow the setup guide below. To enable Social Login you have to enter your OneAll API credentials and you must setup the social networks that you would like to use. 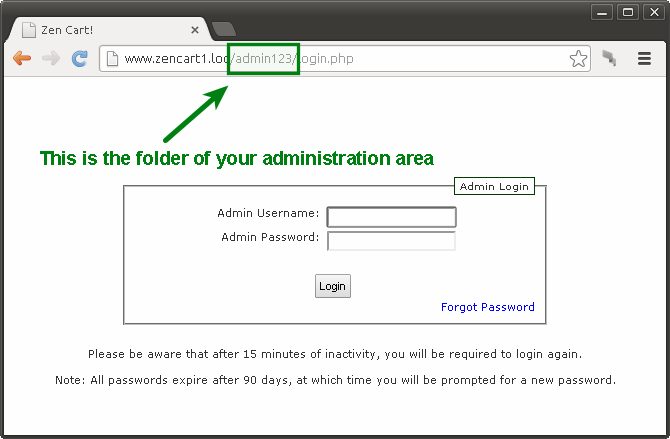 Open your Zen-Cart admin area and navigate to Tools \ OneAll Social Login. Click on the button Click here to autodetect the best connection settings. You should receive a success message if your server is able to communicate with our API. Your firewall must allow outbound requests on either port 80 or 443. To obtain your API Credentials you need a OneAll Site. If you do not have a site yet, you should create a new site for free now. Fill out the API Settings and click on the Click here to verify the API Settings button. You should receive a success message if your credentials are correct. d. Enable the Social Networks that you would like to use. Tick the social networks that you would like to use and save your settings. Please note that many social networks require that the webmasters register their website before being able to use more advanced features. To be able to use the plugin, you must therefore register your site. This process is straightforward and takes only a couple of minutes. It has to be done only once for each provider and we will guide you through this process. To setup your providers, please login to your OneAll account, select your Site and then click on Social Networks. Just edit any .php file (e.g. tpl_login_default.php) in your templates directory and paste the code at the location where you want to display the icons. Feel free to fork our Zen-Cart GitHub repository to contribute to the development of this mod.